Pottery artisan trending his kiln in Zakimi. 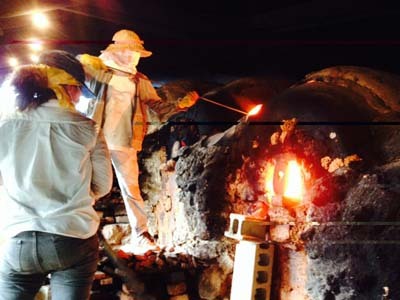 It’s an annual event taking place on the third week of December, when the studios of Yuntanza kiln and Yuntanza north kiln will get together. It is one of the most popular pottery ‘Yachimun’ fairs on Okinawa. Eight pottery makers will directly sell their works to customers, so people can get genuine Yachimun of local studios at savings of 20~30 %. There are many Yachimun fans waiting for this event and recently, a lot of tourists have visited. People can meet and talk to artists, too. Other than that, there are food stalls and local specialties from Yomitan Village. 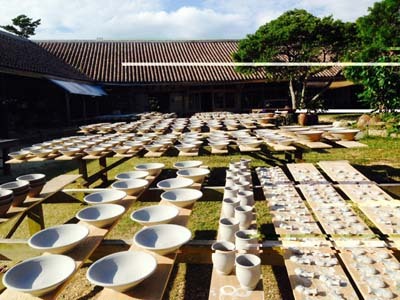 The Yuntanza-yaki Pottery Fair is today through Sunday from 9 a.m. ~ 7 p.m. The fair takes place at Yachimun Village in Zakimi, Yomitan Village. Yomitan has been the center of Okinawa’s pottery production since the war.